Christopher J. Rapuano, MD, shares an unusual case of a 68-year-old woman on whom he had performed a corneal transplant combined with cataract surgery 4 years prior. The patient had a dense herpes simplex scar and dense cataract. 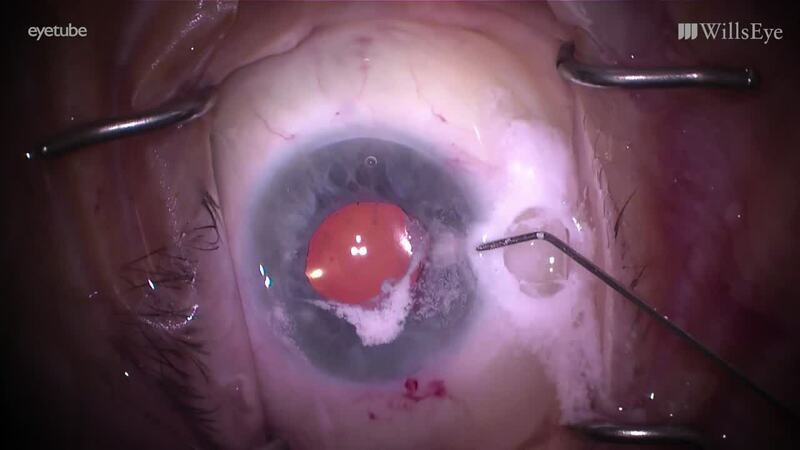 Due to the density of the scar, Dr. Rapuano did an open-sky cataract surgery, during which the capsule broke and required an anterior vitrectomy. A posterior chamber IOL was placed in the ciliary sulcus with good anterior capsular support, followed by a corneal transplant. The patient presented years later with sudden decreased vision. Upon examination, it was discovered that the posterior chamber IOL had significantly subluxed inferiorly. Dr. Rapuano explains his strategy to suture the posterior chamber IOL to the patient’s iris, showcasing his surgical steps and challenges encountered in carrying out this approach. Amazing surgery Dr Rapuano. What is your protocol for antivirals in post keratoplasty cases.